Though not always known by name, those who have experience with any non-Android DAP from the past few years are likely familiar with Hiby. They develop the software that runs on almost all of these devices, including those from Fiio, Cayin and Shanling, the list goes on. Hiby are masters of software and the R6 represents their first attempt at a complete in-house developed product. And, given the popularity of Hiby’s software and the size of the company, they’re afforded certain liberties with specification and pricing unattainable by smaller companies. It was during recent correspondence with other manufacturers that I was alerted to the difficulties of making a smart DAP. Android is an immensely powerful platform with great software support. However, in terms of sound, there are far more variables at play that manufacturers have to consider. Using their experience with software development, Hiby promise to rectify this. The R6 runs full Android 6.0 with DTA that bypasses Android’s native audio processing. It’s also the first midrange DAP to use a Snapdragon SOC, the same used in modern smartphones. The R6’s hardware is also impressive, featuring two ESS Saber ES9028Q2M DAC chips and the option of either an aluminium or stainless steel housing. It has a vivid 4.2” screen and a 4000mah battery crammed into a housing the same size as the X5 III. 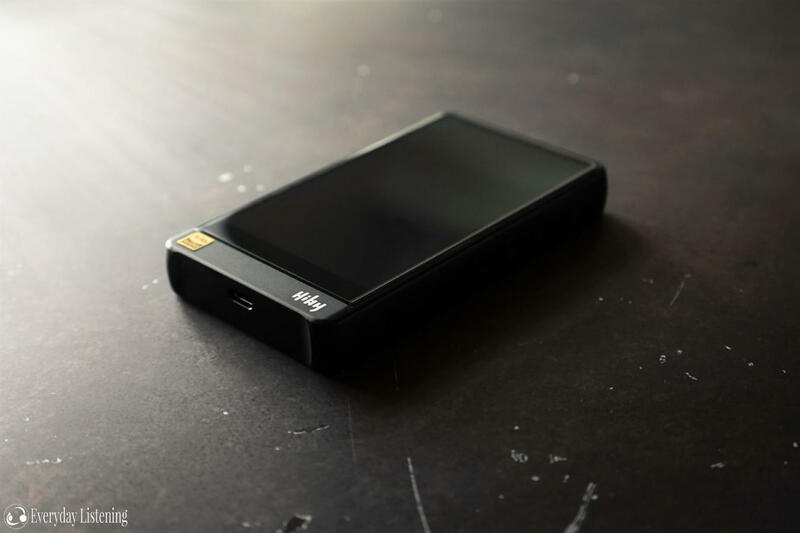 To put that into perspective, the aforementioned Fiio has a smaller 4” display and a 3400mah battery. But perhaps the R6’s most impressive aspect is its price. At just $479/529 on Hiby’s Indiegogo campaign ($650 USD RRP), the R6 represents terrific value, making it a product of interest for many. You can read all about the R6 on Hiby’s campaign here and their website here. I would like to thank Joe from Hiby very much for his quick communication and for providing me with the R6 for the purpose of review. All words are my own and there is no monetary incentive for a positive review. Despite receiving the DAP free of cost, I will attempt to be as objective as possible in my evaluation. The R6 has a more comprehensive accessory suite than most, providing everything the buyer might need to take full advantage of the R6’s features. Their small hard box contains the R6 itself in addition to high-quality braided USB Type-C and Coaxial cables. Hiby are kind to provide clear film protectors front and back pre-installed from factory to prevent scratches with two additional protectors included in the box. Hiby also offer a tempered glass option at additional cost. Interestingly, Hiby also provide some High-Res audio stickers for reasons inexplicable to me. I love the freedom afforded to DAPs. Truly daring designs like the Shozy Alien are something long lost to the homogenous smartphone world. However, on the other hand, DAPs like Fiio’s X7 II and iBasso’s DX200, though respectable within their class, don’t feel perfectly adapted towards their smart interface. In this regard, the R6 feels years ahead; its curvaceous unibody housing and impressive screen to body ratio contributing to both enhanced ergonomics and a sleek, streamlined aesthetic. The back of the DAP is glass with metal of choice (aluminium or stainless steel) forming its perimeter. It’s a compact player, with similar dimensions to the Fiio X5 III and Hidizs AP200, making it considerably smaller than the iBasso DX200 despite having the same 4.2” screen size. It’s still not especially slim, but its lack of bezels and a bottom amp module allow for easier one-handed use. I was also very pleased by the finish of the player; my anodized model had a smooth, even surface with no visual or palpable defects. What especially impressed me was the machining on the edges; the R6 is smoothly rounded, granting a much more ergonomic in-hand feel. Compared to the sharper edges on the X7 II and DX200, the R6 is a step above. The control scheme is also well thought out, with an asymmetrical button layout. The audio outputs are at the top of the DAP, an unconventional placement that will ultimately come down to user preference. The buttons themselves are terrific, countersunk for tactility and very clicky with nice travel. The volume buttons are on the left while the media controls (play/pause and skip track) are on the right. An illuminated power button is on the top right, it’s well separated from the other buttons to prevent accidental presses. On the bottom of the player is a USB Type-C port. This is a much better connector than micro-USB, far sturdier and reversible. The R6 accepts a single micro-sd card using an integrated tray. Other touches that make the Hiby so outstanding to use include 2.5D curved glass over the display that more gently guides the finger. These small considerations all culminate to form a DAP that excels during daily use. Does R6 drop volume when EQ is enabled like in X7 II? I already have Cayin i5 and I’m guessing R6 is not a great upgrade. So I’ll just save my money and look for an iem upgrade. Speaking of which, I haven’t really found an upgrade to my EN700 bass ( around same price). And going by your brief impressions, I think King Pro will be something I’d really want (not too bright, slightly less pronounced low end, clearer than EN700 bass). Hope to see King Pro review soon,. No worries, I’ll be sure to put a comparison with the Simgot in there. I had just read only good things about R6. That hardware as well as software is hard to beat at this price. Btw, TFZ king pro name drop (twice). Can we expect a review coming soon? I’d be really grateful if you can share a few expressions..
Hi Shaan, the R6 is very good for sure, just watch out for the output impedance, I can’t understate its significance. If you’re looking into the DAP, be sure to read some other reviews too. I will review the King Pro soon, it’s very impressive so far. Excellent build quality, not as bright and forward as the original King. I think this IEM will be very well received by buyers and critics.